My aunt found this the other day when she was cleaning. 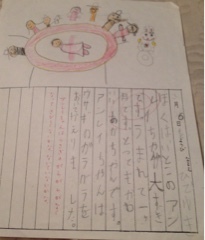 It's a sakubun my cousin wrote for Japanese school--an essay. My two older cousins and I went to Japanese school on Saturdays growing up (for the record: I slept with my eyes open through most of it). This sakubun is special because it's about me as a baby. I wish I could read Japanese better. I can just about read the sakubun. I suspect that our grandmother dictated this to my cousin because there's no way that an 8-year-old boy is going to write things like, "My cousin is really cute and I like her very much." I remember writing sakubuns nearly every week for Japanese school. Sometimes my mom or grandmother would dictate them, other times they would write some of it and I'd copy it down. But for the most part, I remember sakubuns being the only thing I enjoyed doing for Japanese school. My math in any language is terrible, my grasp of Japanese kanji has always been deplorable, and because my grasp on kanji is bad, my reading skills were never particularly great. And history buff that I am, I don't know much Japanese history. Some of this was lack of interest when I was in Japanese school, some of it is because my mom is not a history buff, and some of it is because American and European history is taught more readily in American school and a heck of a lot more accessible in the U.S. in general. I know about twentieth century Japan, thanks to my grandparents. 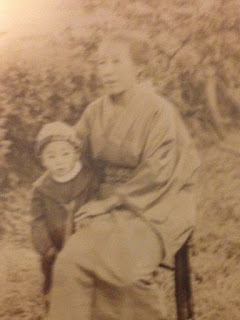 I met my great-grandmother when I was 6. She was born in 1904, which is the Meiji Era in Japan, when the Emperor Meiji presided over reforms, Westernization, and industrialization. So, really, having met a relative born in that time period, it doesn't seem that long ago. Beyond that? I know a little about the Edo period and a bit about Japan isolating itself for two hundred years while they thought up things like ninjas and confusing ways to count different types of objects (seriously. Check it out. It's ridiculous.) I know about Dejima, which was the island in Nagasaki Bay that the Dutch traders were confined to, Commodore Perry and his black ships, and I've heard of the Shimabara Rebellion--these are things that happened in places where my family is from. Yeah, other than that? I got nothin'. Last year, I read a book called Yokohama Yankee, a non-fiction book about a mixed German-Japanese family that descended from a Japanese woman and a German merchant who settled in Yokohama in the late 1800s. Until then, I hadn't realized that there was a small community of foreigners and mixed families living in Japan from the Meiji Era. This summer, I read Kwaidan, a collection of Japanese ghost stories compiled by Lafcadio Hearn, an Irish-Greek man who moved to Japan in the Meiji Era, wrote several books about Japan--some of the first ones written by a Westerner--and married a Japanese woman. I'd heard of him previously though; I remembered his name from some distant cloudy place. 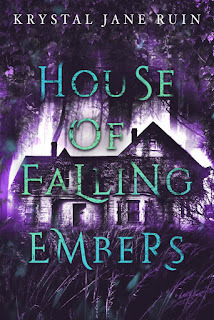 The last three books I read were the Kumashiro Saga by Christina Courtenay. They are The Scarlet Kimono, The Gilded Fan, and The Jade Lioness and they take place in the 1600s in England and Japan. They're historical romance action adventure stories and I loved them. They included: girls dressing as men in order to travel more safely or disguise themselves, daimyos and samurais, the shogun and ninjas, Dejima and the Dutch traders, diverse casts, rollicking adventures, and interracial marriages. Plus, an integration of Japanese culture and attitudes that I found fairly realistic (if a bit modern) that did not make me roll my eyes. Now I have a hankering to read more Japanese-set historical fiction. Not that geisha book, though. Who knows? I might write a story set in the Meiji Era. I mean, it roughly corresponds to the Victorian Era. Or maybe I'll go see if my mom kept any of my old sakubuns. I wonder what I wrote about. That's really cool. I was obsessed with Japan for a little while at the height of my anime obsession. I wanted to teach myself phonetic Japanese so I could rely a little less on the subtitles. Lol! It's not an easy language to learn (understatement). It's really not an easy language to learn at all. Just the two alphabets and the kanji are enough to throw someone off. Fascinating. How great to discover more about your own history, and have the ability to share it with others. As a kid, you were probably wishing you could go outside and ride your bike! Who knows. And, good point about American schools and history class. It's almost all European history and how it relates to American immigration, like they're the only ones. I'd love to read your future book on Japanese history, culture, and your story. I wanted to watch cartoons and sleep on Saturday mornings! I was reading about one just today that's coming out--oh it was a novella about a girl who becomes a match maker. (Was it in Japan? I think so...) *shrugs* I love anything that transports you to another time and place...unless it's sci-fi. Mostly. An aspect I hadn't been aware of before. Oh I didn't know Indian men immigrated to Mexico! So there are Mexicans of Indian descent? There are small communities of Japanese in Brazil and Argentina from the nineteenth century. Don't know if they intermarried much with Brazilians and Argentinians though. Yes! There are. Yep, there are actually a number of Asians in Latin America. In high school there was a super cute Asian guy who spoke perfect Spanish. His parents had either been born or migrated to Argentina. I know there's an Asian family in a nearby village where my parents are from. TJ has some too. And Middle Easterners make up a significant part of the Latin American population. I know of many Middle Eastern men with Hispanic women. And the mix of those are some of the most beautiful people I have ever seen. It's amazing how people migrate to countries far away. Fascinating. There was a Korean girl in my elementary school who, I think, had either grown up in Peru or Ecuador. Anyway, she didn't speak any Korean, but she spoke Spanish. And Salma Hayek is Mexican and Lebanese, right? And Shakira is also part Lebanese as well. And I think there were European Jews who migrated to South America before the Holocaust. So fascinating!